A wall painted in memory of a Welsh village flooded 42 years ago to provide water for Liverpool has been defaced. The landmark near Aberystwyth is painted with Cofiwch Dryweryn (Remember Tryweryn), but that has been altered to Angofiwch Dryweryn (Forget Tryweryn). The additional wording has upset some local people, who described the site in Ceredigion as a "national landmark". The wall has deteriorated in recent years and the Welsh Language Society is planning to preserve it. 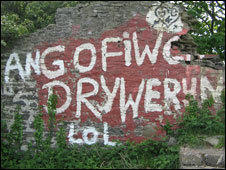 The original slogan was painted shortly after Tryweryn, near Bala, disappeared in 1966. Glyn Davies, former chairman of Llanrhystud Community Council, the nearest village to the wall, said it was not known who had defaced the landmark. "It's a landmark and it's a great shame it's been altered," he added. Mr Davies said the community council had looked at restoring the wall, but it was unable to apply for lottery grants. Costs were put at about £1,000 two years ago. Dafydd Morgan Lewis of the Welsh Language Society (Cymdeithas yr Iaith Gymraeg) described the news as disappointing. He added: "The wall will need to be rebuilt because it's not safe, and it has been re-painted in the past when the letters have faded but the message has always been kept the same." Mr Morgan Lewis added the society had approached Ceredigion AM Elin Jones as part of an attempt to preserve the wall, and she in turn had contacted Wales' Culture Minister Rhodri Glyn Thomas.